Best Shoes for Kayak Fishing - The Most Comfortable Shoes of 2019! Looking for a great pair of kayak fishing shoes to help keep your feet comfortable while fishing? There are several different types of shoes that a kayaker may use, especially if they kayak regardless of the season – summer, fall, winter, or spring! Here, we will go over the best shoes for kayak fishing for your money to help you narrow in on the exact shoes you need! Kayak shoes help protect your feet when you get in or out on rocky shore, as well as keep your feet warm in cool weather. This pair is absolutely phenomenal if you kayak in cool or cold water. They are 5mm thick, so they’ll keep your feet as well as your lower leg warm and dry. They are completely waterproof as long as you don’t get water over the top of them. The hardened sole is great for portaging and hiking as well. Keep in mind that 5mm of neoprene will definitely have your leg sweating if it’s hot out! Reviewers say they fit great, and were one of the best investments they’ve made for their kayaking experiences. They’re comfortable and warm, and you can wade in a ways in cold water without getting wet. We have them pegged as the top shoes for kayak fishing in cold water experiences. Comfortable, Durable and a Superior value. 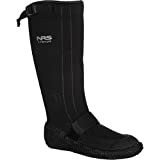 These neoprene boots are the perfect footwear choice for a variety of water sports like diving, paddle boarding, kiteboarding, wakeboarding, kayaking, and many others. For use in, on and around the water. 3mm thickness offer great warmth. Glued and blind stitched seams with heavy duty bonded thread for durability and long life. Soft and flexible Heavy duty tractions sole with an internal puncture resistant liner. Large Sizes available up to Men's 16. One of the best all-around pairs of kayak fishing shoes is right here! The NeoSport Wetsuites 3mm Low Top Pull On Boots are great for cool water use. These boots have a hardened sole that can handle walking on pointy rock shorelines, and they also are easy on and off. With its hardened sole you will feel very comfortable walking over walks. They definitely could get warm in the summer – take a look below at the summer water shoes we have selected. Another great pair of low boots, this time in 5mm of neoprene for colder conditions! These are actually almost the same as the model just above this but just thicker neoprene and having a zipper, making them ideal for cool and cold water conditions. The zipper allows for easy on and off. With 5mm of neoprene, your feet will stay quite warm in most conditions. The hardened bottom allows you to portage your kayak when necessary. All in all, if you prefer lower boots but are in cold water, this pair would be great for you! If you want higher boots, check out the NRS Boundary Boots above. Looking just for a basic pair of water shoes that is cheap but protects your feet on and offshore? These NRS Kinetic water shoes are perfect for just that. They are made of 3mm neoprene, so your foot should stay warm in moderately cool conditions. They have a draw cord around the ankle that you can pull tighter if you need to. The soles on these aren’t too thick, but will allow you to feel the ground underneath you. If you are looking for a minimal pair of kayak shoes, these are ideal for you! This is a very lightweight and easy to slip on pair of sandals from Crocs. If you are just looking for a comfortable yet very breathable sandal just for getting in and out of the kayak, this may be your best bet. The sole is also thick enough to use for portaging! The toe protection will prevent you from stubbing your toes on any underwater rocks, and the upper dries quickly as well. People seem to agree that this sandal runs a little large in size, so keep that in mind while ordering. 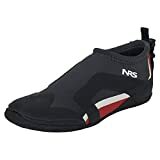 These are probably the best kayak shoes for summer time due to their high breathability yet functionality for portaging and wearing out of the water. Coming from one of the best-known hiking and outdoor shoe manufacturers in the USA is the Merrell All Out Blaze Sandal for summertime kayaking. These sandals are high quality and highly breathable to allow your feet to stay cool in the summer. The lace is a bungee-cord type of material, and the sole has large knobs to help you grip the shoreline when you get out. They dry quickly since most of the upper is made of neoprene, and the ankle has padding to prevent blisters from rubbing. Customers say these shoes fit true to size for the most part, with very little complaints about sizing issues. These sandals would be a great fit for you if you normally do some portaging, camping, or any other activity where it is nice to have a good pair of shoes without needing to bring a separate pair, and are some of the greatest shoes for kayak fishing. Hopefully hope you were able to choose out a pair of the best kayak shoes for fishing for yourself to use on your next trip! Kayaking can be far more enjoyable from something as simple as a good pair of shoes. Consider what you are going to be using them for. The most important quality is if they are quick dry. Nobody wants to spend the day with wet feet! We have found the best cheap kayaks for sale under 200 dollars.